A Greek-inspired blend of sea salt, garlic, oregano, turmeric, chili spice, and lemon. Turkish spices and Greek herbs combine perfectly to be used on your kebabs, roasted fish and on any tomato dish. One taste and your palate will be transported to the Aegean Sea. 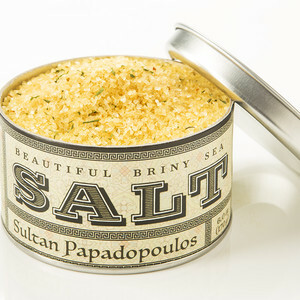 This salt blend from Beautiful Briny Sea contains Pure Ocean Salt with Garlic, Oregano, Turmeric, Chili Blend, and Lemon.